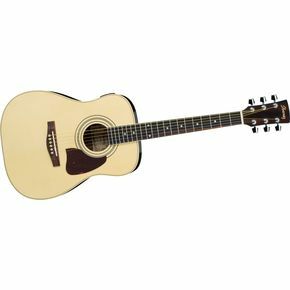 The Ibanez Daytripper Series DT100E Acoustic Guitar is a great little number if you like to have music with you while you travel or bum around the beach or campfire. It is crafted to hold up to any amount of wear and tear, the Daytripper will keep its good looks and playability even after being banged around airports and lugged overland to camping spots. The Daytripper shows that it is a smaller and lighter than the average sized guitar. It is built on a mini-dreadnought body which makes it a great choice not just for those who want a guitar while they are on the move, but for those smaller or younger players who would like to be able to play a dreadnought, but who can’t handle the full-sized models. Plus, you'll like its attractive finish. Guitar reviews usually do not find travel guitars to be as good as regular sized acoustic guitars, and the Daytripper is no exception. With a spruce top and mahogany back and sides, the DT100E has a surprisingly full-bodied sound for a smaller guitar, and a volume which, while not extraordinary, will definitely let you be heard around the campfire. While the Daytripper does not have the volume nor the tone of a full-sized guitar, it is not bad for the price, though it does tend to buzz a bit, especially on the higher notes. The DT100E also comes with a built-in tuner, which you will need as this little number tends to lose its tuning fairly quickly. But at just ~$199 it is not a badly priced little number, and will do what needs to be done with a minimum amount of fuss and will keep the music at your fingertips no matter where you should decide to go.